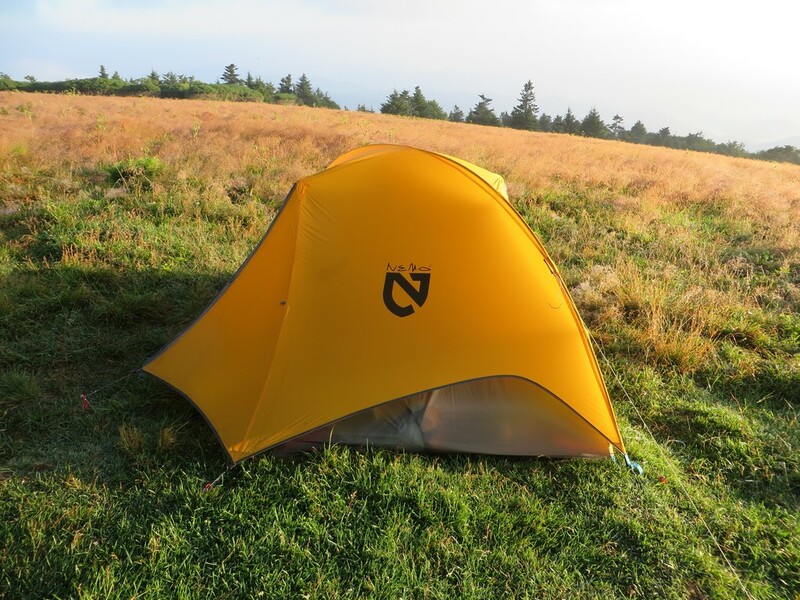 The Nemo Blaze is one of the lightest, roomiest full featured tents ever built. At a ludicrous 2 lbs 5 oz, the Blaze offers 30 sq feet of floor space, and a max height of 40 “. Can a tent this light and this spacious be too good to be true? The Blaze 2p, as mentioned above weighs just 2 lbs 5 oz. This is achieved by using astoundingly thin materials such as a 7D PeU Nylon ripstop fly, and 20D PeU Nylon Ripstop Floor (both with 1200mm coatings). Combine this with an innovative single pole design that runs from one corner to another with an angled crossbar to create near vertical walls and you’ve shaved a lot of weight. 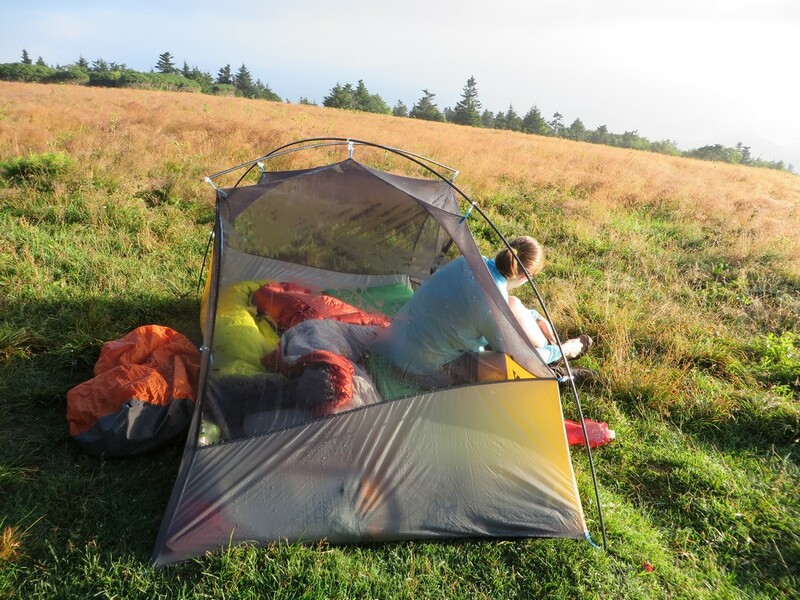 Furthermore, the rain fly is slightly cut back at the head and foot of the tent, minimizing material usage, while the vestibule weight is minimized by shifting the compartment back, providing gear storage but also through room. The poles are made of the recent favorite 8.7mm DAC Featherlight NFL aluminum. The tent still manages to have two full vestibules and two doors, all for $449.95. The space to weight ratio here is staggering, especially considering the full (mostly) double wall construction. The tent disappears in a backpack, and weighs so little that a solo backpacker can easily carry it without feeling any packer’s remorse. While inside, the tent offers more than adequate head and shoulder room for two backpackers to comfortably sit up and move about. The 50″ wide floor is wider than most tents that weigh more, and combined with the 40″ of head room, the Blaze provides unheard of living space per lb. the wide doors allow for easy entry and exit, thanks to the long zippers that open up completely to avoid obstruction of movement. The vestibules are just big enough to provide storage of backpacks and boots, while still being able to move through without too much climbing over, assuming you don’t mind doing a little gear stacking. Lots of mesh and low walls around the sides of the sleeper produces good air flow, without creating a cold breeze around the head or foot. This allows for a nice cooling effect in hot weather, but also helps knock down chills on areas sensitive to the cold. The mesh provides ample opportunity for star gazing also. 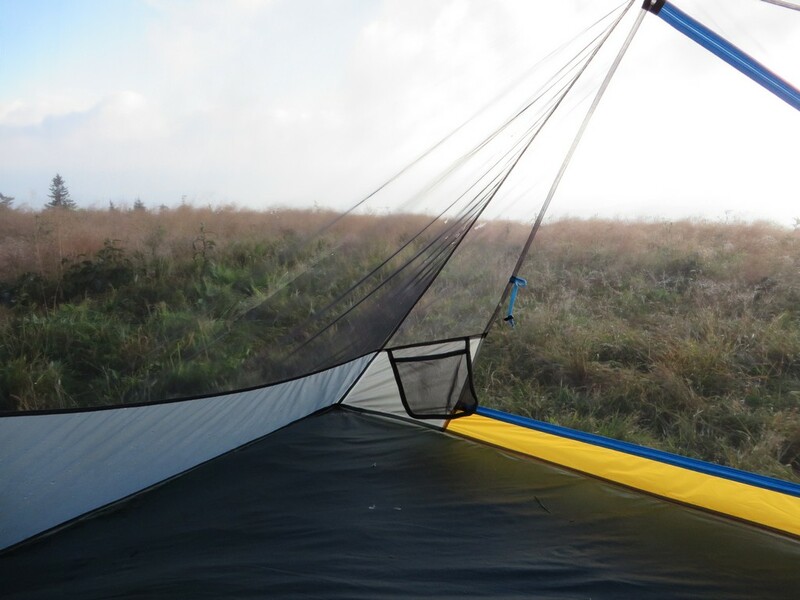 The cut back rain fly around the head and foot strategically allows air to flow up and inside the top of the tent, reducing condensation and improving airflow. 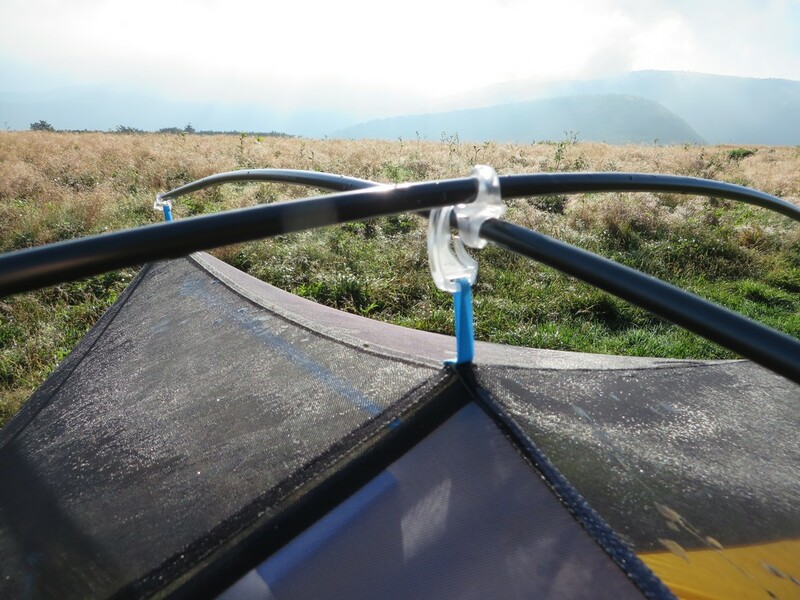 The tent is surprisingly stable despite the single pole frame. The shelter tensions and stakes out in a way that minimizes the impact of wind, and guy out points half way along the vestibules add solid side to side protection. Once fully guyed out(by adding additional lines, more on that later), the tent holds strong without wavering too much in the wind. The only issue comes in the pole free corners. More on that later as well. The included tent stakes are pretty solid, holding great and providing enough durability to be hammered in lightly with a stone. With great weight savings comes a few sacrifices. The most notable issue is that the corners that have no poles can sag under less than ideal pitching conditions. This creates a loose corner that can hang down onto the sleepers face or foot, which is a compounded issue if there is lots of humidity in the air, and thus condensation. Not only will the fabric touch the foot or head of the sleeper, these areas pick up condensation due to the pseudo single wall section, and creates a damp environment that can wet out a sleeping bag. A good pitch minimizes the issue, but we found ourselves stuffing gear into the corners to keep them out of the way when conditions were poor. The same corners can buffet in the wind, even with a good pitch, causing some light annoyances and possibly shaking off condensation. The corners can sag a bit if not pitched in ideal conditions (lumpy, loose soil, etc). No vents in the top of the tent, and no double zippers for venting the doors creates a mildly condensation prone environment. The positioning of the internal pockets in the frameless corners of the tent makes them nearly useless when trying to store heavier items like cameras due the added pull of the fabric. This lowers the already problematic saggy corners further into the floor of the tent. I can’t understand why they weren’t stitched into the opposite corners where the poles would serve as reinforcement. To fully guy out the tent you’ll need to carry a few extra tent stakes and lines that aren’t included (4 in this case). This significantly improves the stability, and is highly recommended. When pitching, stake out the body, starting with the pole-less corners. Then stake out the corners with jakes corners (pole connections), and finally install the poles and erect the body. This better tensions the tent and minimizes sagginess. If you have a wrinkle in the floor, keep working at it. A skilled seamstress could add additional guy lines to the saggy corners, creating a volumizing guy out point. This would eliminate flapping, improve internal space, and improve condensation management. Despite a few issues with condensation and saggy corners, the Nemo Blaze is still an outstanding tent. Having so much living space with a tent that packs so small and weighs so little almost seems impossible, but Nemo made it happen. The massive interior (for the weight) provides great livability, with ample star gazing opportunities with the breezy mesh walls. The creative guy out points and tensioning of the body creates a mostly stable tent from any angle despite the limited framing. 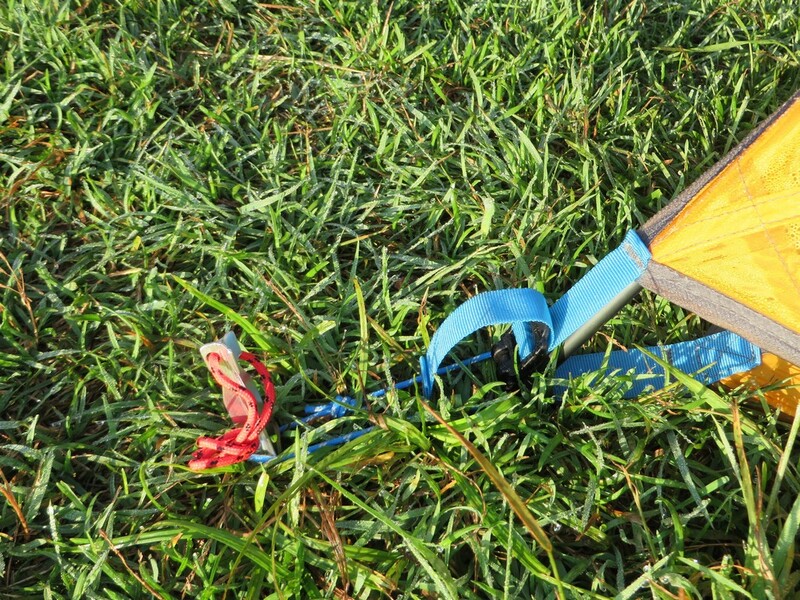 Take time to pitch the tent properly to avoid a saggy body and add a couple guy out lines and stakes, and the the Blaze 2P is an excellent choice for those who prioritize minimal weight and maximum space. Added this photo per request for scale. 5’10” tester inside. Big thanks to Nemo for providing this tent for review. We couldn’t make it without your support! Our full review disclosure and ratings system can be found on our Contact us page. From the photos, the interior tent looks incredibly saggy. Is that almost impossible to fix? I have a nemo meta 2p and was considering the update for almost 1lb weight savings, and a fix to a bit of condensation that the meta has. If this tent has condensation problems at the head/foot – is it really a worthy upgrade for 500 dollars? As for your question, with the proper pitch (pole-free corners staked first), you can avoid most of the sagging. You can also attach your own guy out points on that wall, and stake that out for more volume if you don’t mind some light modification. If the Meta 2p hasn’t caused you any problems with condensation, this one won’t either. The Meta was far worse in my tests. The condensation is much less an issue with the Blaze 2p. Not to mention the easier pitch and incredibly light weight. It sleeps quieter too. If it was me? I would happily upgrade. Let me know if I can offer more assistance! Thanks for the info – It’s approaching out-of-season for me, so I will probably be waiting a couple of months to ‘spring’ for a new tent. Hey! Thanks for the review. I have been trying to find out more about this tent and there is NO info out there! I actually went to REI today and they didn’t have a blaze but they had a Hornet. I set it up and was really disappointed by the size. It was TINY. I set it up next to an REI DASH and it was substantially smaller. I could barely sit up in the Hornet and I’m 5’6″. I had to be in the middle and leaning a bit forward into the highest part of the pitch. There is NO way 2 people could sit up at the same time in the Hornet. What’s the space like in the Blaze 2p? Don’t worry I’m not unrealistic, I look at 2p tents, more like 1p + dog tent but with some tents you can easily make it work for the weight. Could you make a space comparison to any other tent? Do you have any images of people in the tent? Also how do you think this tent would do in storms? It’s a little concerning that it only has one pole. Hi megan! Thanks for reading. I’m doing my best to try to post new information that no one else has. So far so good! It’s fairly roomy actually. 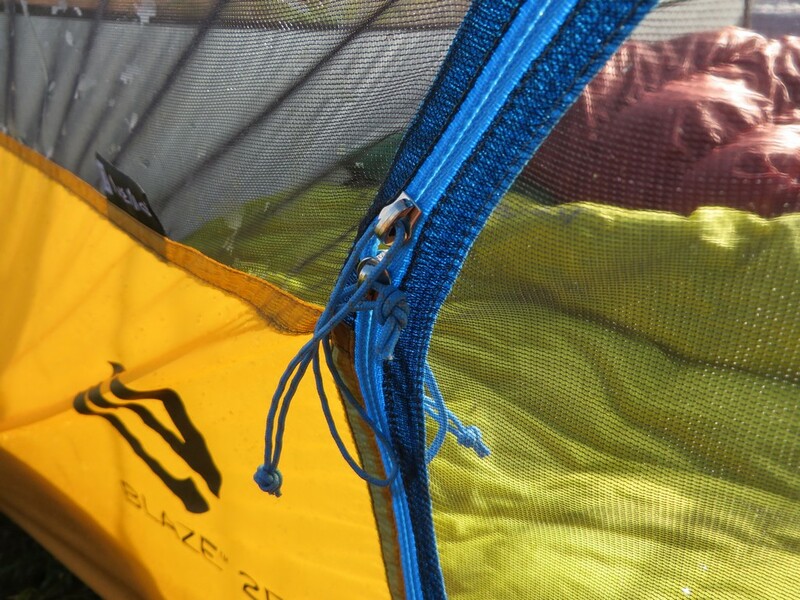 About the internal volume of the Big Agnes Copper Spur 2. I find it more than adequate. So far, stability has been pretty good, but it is an ultralight. It’s better to avoid exposed peaks. I’m actually working on wind tests right now on this tent to see how it holds up. I’ll update as soon as I get some solid results. I’ll add a photo at the end of the post showing a test (5’10”) inside the tent. Awesome! Thanks for the image! I’m intrigued by this tent! Wish I had it for my recent JMT hike. Would have saved me about 2lbs 🙂 I’m looking forward to all the ridiculously light tents that just previewed at OR. Looks like next summer we’ll have A LOT to choose from! 2 lbs can make a world of difference. Especially over a long distance. 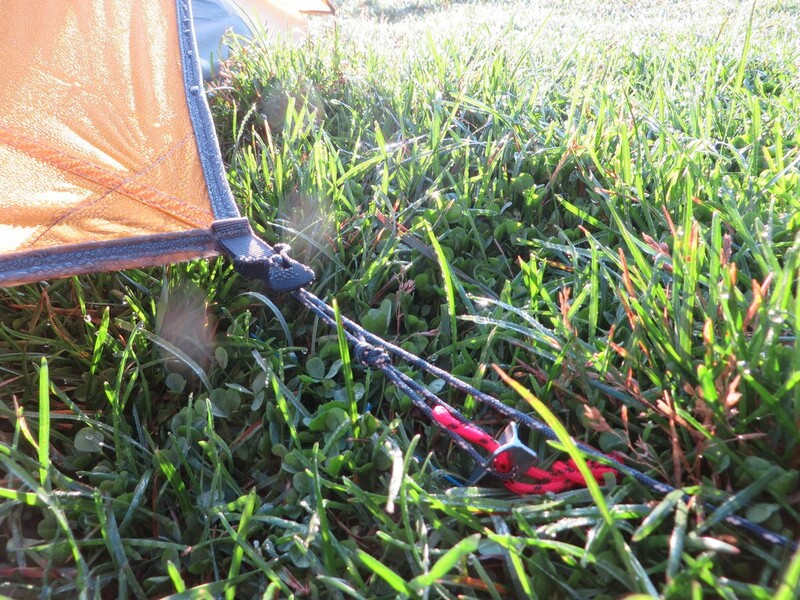 You might also check out the Tensegrity 2 review, as it just went live, if you’re into trekking poles. I love decisions! Have you been able to get this tent out into any storms? I’ve been reading your reviews wondering for livability and storm-abilty in the lightest weight packages, what’s the winner? I have actually. It does pretty well, for the weight, but there are certainly more stable tents. I would go with the Tensegrity 2, or the Big Agnes Copper Spur. My personal favorite, although I don’t consider it the best, is the Sierra Designs Lightning 2 FL. My personal favorite is the Sierra Designs Lightning 2FL as well. 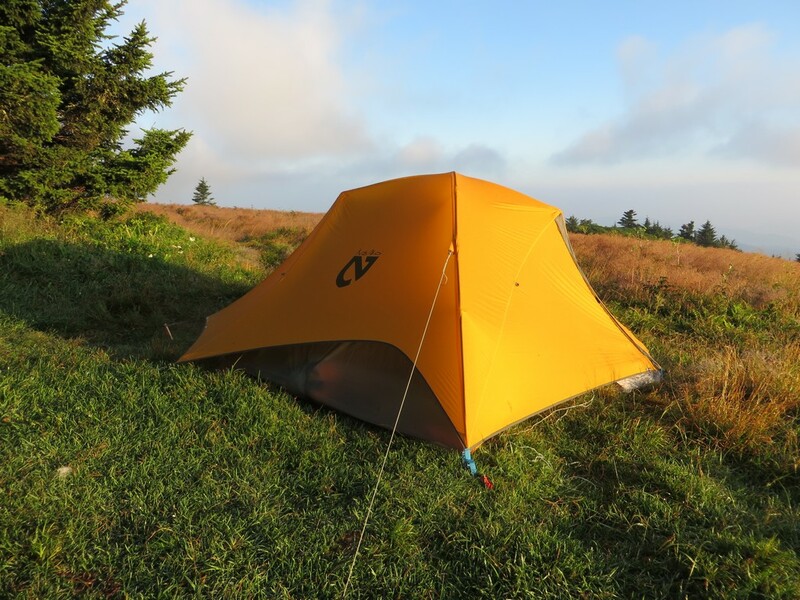 With the 2015 model weighing in at an astonishingly light 2 pounds 7 ounces (verified by my scale at home) for the space and full feature set one gets with the Lightning, it’s hard to imagine a better tent out there today. I’m curious what leads you to have the lightning as your favorite, but not thinking it’s the best, please? It certainly is an impressive tent. And more durable than those of similar weights also. If they would release a version that was full double wall, I would consider it the best and my favorite. With that one single wall section, sometimes I’ll end up with a damp sleeping bag in humid conditions. Other than that, I cannot complain. Hey I know I already asked you this but I was wondering if you have had any more experience with this tent in storms and how it does? I know there are plenty of more stable tents, but this is by far the most spacious tent for the weight so wondering if you think it’ll suffice in big storms, or worth it to carry a little more weight for more protection. I used it for a weekend of winter camping and it was HUGE for the weight but feels super thin and the weather was good so wondering if how you would rate it for weather, or what your go to lightest all purpose tent for 2 people would be? Glad to see you’re still reading! It’s certainly not the best choice if your priority is weather protection. For light weight packing in fair weather, it’s fantastic. It will hold up to rain and winds into the 30’s pretty well. But, when you get this light, there simply isn’t enough material to hold down on a really big storm. You will be o.k. in most situations, but I if you plan to camp in snow or on exposed peaks often, I would recommend something burlier. Of course, you can always add additional guy line and points which will make a big difference. Perhaps consider the Nemo Dagger, as it’s a much more stable design. I mean I would say I’m a fare weather backpacker for the most part and I don’t set up camp on peaks or super exposed places. I RARELY if ever set out when I know the weather will be bad but I backpack mostly in CA and occasionally in CO where the afternoon storms can roll in or just a random storm no one knew about rolls in. So I just don’t want to get caught with out adequate shelter. It’s between this tent and the tensegrity but this is so much lighter then the tensegrity. Every March or so, REI puts out a 30% discount code for members. It’s an excellent time to buy a tent. I normally recommend that when people are looking for something new, especially this time a year. I do like the Slingfin! Very comfortable tent, and truly a build that you can rely on in a rough storm. What is your opinion of the Sierra Designs Divine Light FL 2? I haven’t tried this exact model, but I have tried some of their very similar older designs. I really like the frame system, they are strong and do pretty well in the wind. My only concern would be using it in a humid environment as condensation will build up on the walls and cause some issues. If you live somewhere relatively dry it would be a nice option. If you live somewhere more damp, the Clip Flashlight would be a better option. It’s actually a bit lighter and cheaper, but you’ll have far less storage space. My favorite in their line right now is the Sweet Suite 2 though. Thank you for the quick reply! Most of our hikes are in CA or west Tx, so relatively low humidity. 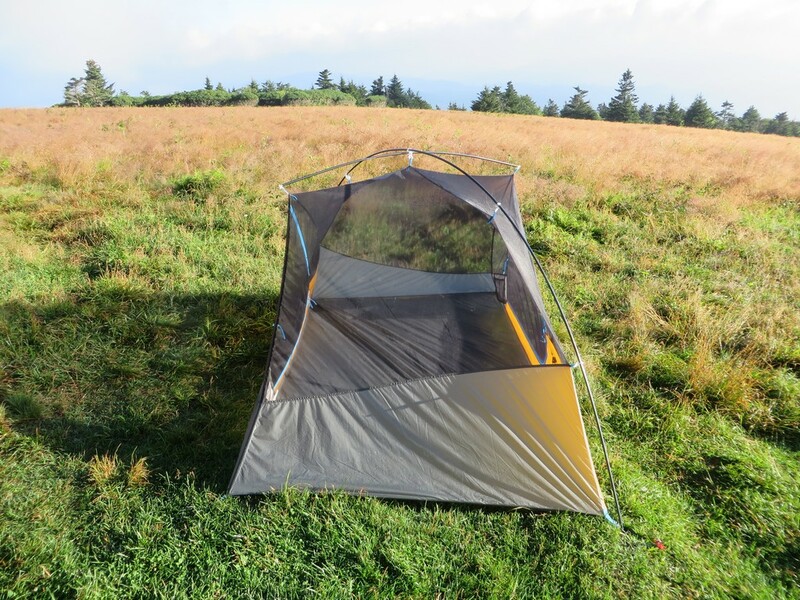 The low weight and large storage are very enticing, but we have never owned a single wall tent before and are concerned with the condensation issue you point out. We have done a fair amount of research on the tent (really limited actual user reviews), and it appears that the 3 doors do a good job of combatting condensation. Considering your location, I don’t think you’ll see any problems. Even here (I backpack most in TN and NC) where the condensation is so bad that drops build up on walls and eventually rain down, it’s still manageable with that design. You’re not likely to come across anything other than a little dampness here and there that might dampen the tips of your sleeping bag. Pack a small camp towel to wipe it down with and you should be good to go. Like you mentioned, the ventilation is quite excellent on these and the open design is quite attractive. Copper spur HV UL2 vs Nemo Blaze? I already have Hubba Hubba NX, but am looking to try a new tent on the PCT this summer and simply cannot decide between the two. 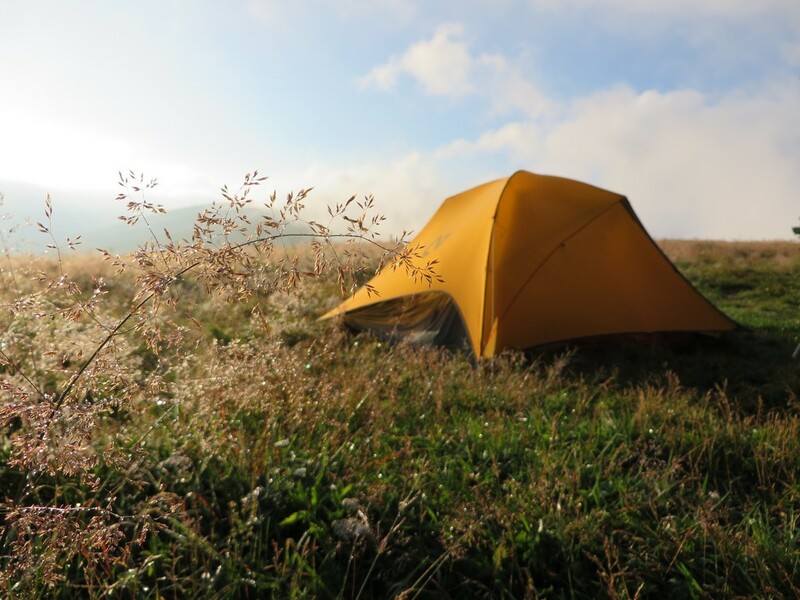 The Copper Spur seems like an all-around better tent, but this one is so much lighter. Just trying to decide if it is worth the few issues it has for the half-pound in weight savings. Any advice? That is certainly a tough one. I, personally, would probably go with the Copper Spur HV UL2. It’s just a better rounded tent. However, you will certainly be putting down the miles and the extra weight will make a difference. Might I suggest a third option? The Big Agnes Tigerwall UL2. I have a review upcoming, but to spoil it a bit, it’s great and would only cost you an extra ounce or two over the Blaze, without the compromises. The ventilation is pretty good (not amazing) but it’s a full double wall, so there is no contact from moist walls with the sleeper. It’s a little tighter than the Blaze, but not by much. 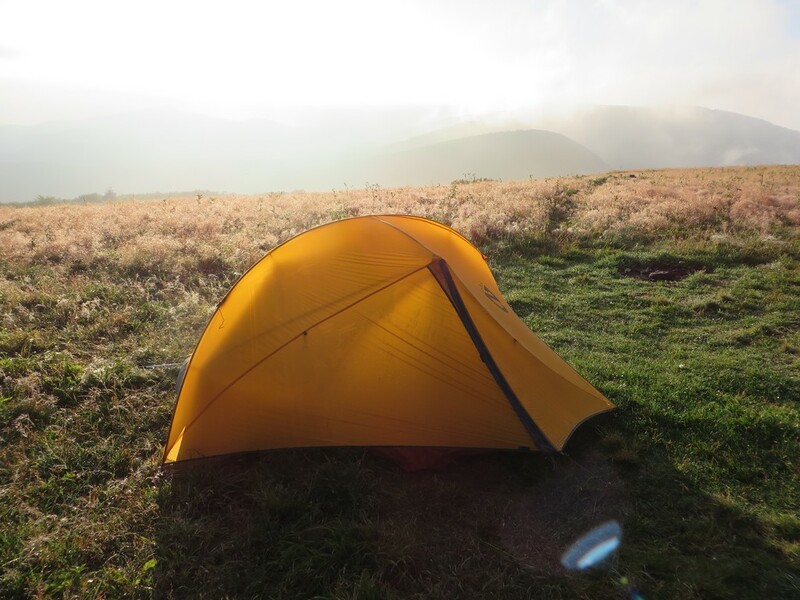 If you plan to move in your tent a lot, a larger one might be worth the extra weight of a larger tent, but I have a feeling you would be carrying it more than actually living inside it. If you’re slim sleepers, it would be a good fit. It your’e on the larger or taller side, maybe step up to a larger one. Thanks so much for the info! I look forward to your review!